Most women continue to work during their pregnancy, whether they work from home, or travel to a workplace. 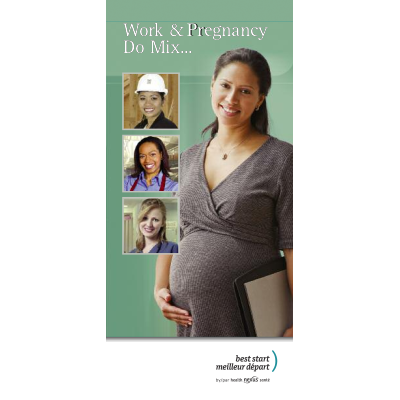 This brochure will help pregnant women or women planning a pregnancy think about how their work may affect their health and the health of their unborn baby, evaluate the risks and find ways to reduce them, and find sources of additional information. Also available in French, Arabic, Chinese, Hindi, Punjabi, Spanish, Tagalog, Tamil and Urdu.